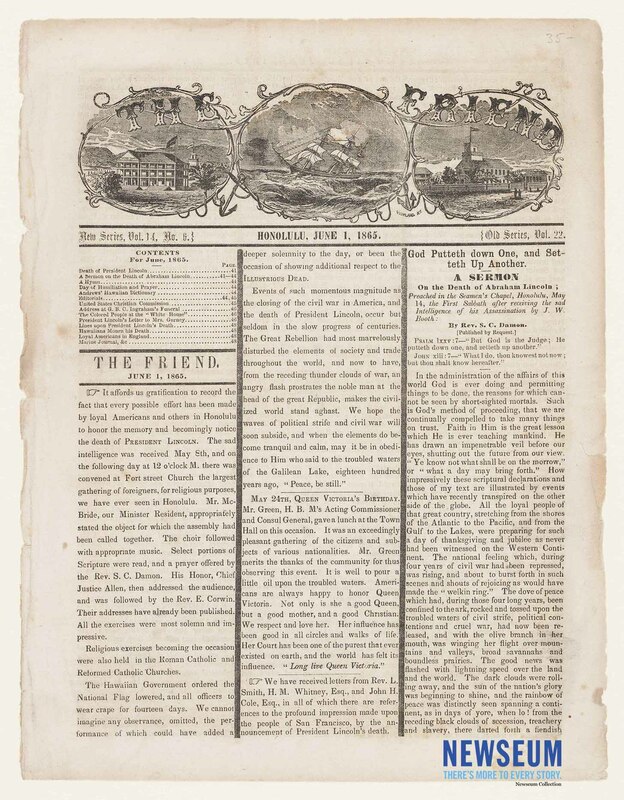 The front page of The Friend newspaper published in Honolulu, Hawaii indicates the news of President Lincoln's assassination did not reach Hawaii until May 8, 1865. Information is provided on religious services, as well as the printing of "A Sermon on the Death of Abraham Lincoln" by Rev. S.C. Damon [Samuel Chenery Damon]. Known as "mourning rules," the wide vertical lines between the newspaper columns represent grief over the loss of an important person. Use of this item for research, teaching, and private study is permitted with proper citation and attribution as follows: Courtesy, Newseum Collection. Reproduction of this item for publication, broadcast, or commercial use requires written permission. For permission, please contact us at artifacts@newseum.org.